Our objective, Peak 8514, or Hidden Peak, rises above the huge lateral moraine. We named it Hidden Peak because it was almost always hidden from view. “I think we might try and climb something” I said to Sy, my long time partner of Alaskan adventures. “Really? What mountain, where?” he responded with a mixture of skepticism and intrigue. “Well, I need to photograph in the remote Nutzotin Mountains, but I am willing to take a few days off and focus on climbing a peak. None of them have names, don’t even know if they have ever been climbed?” I replied. 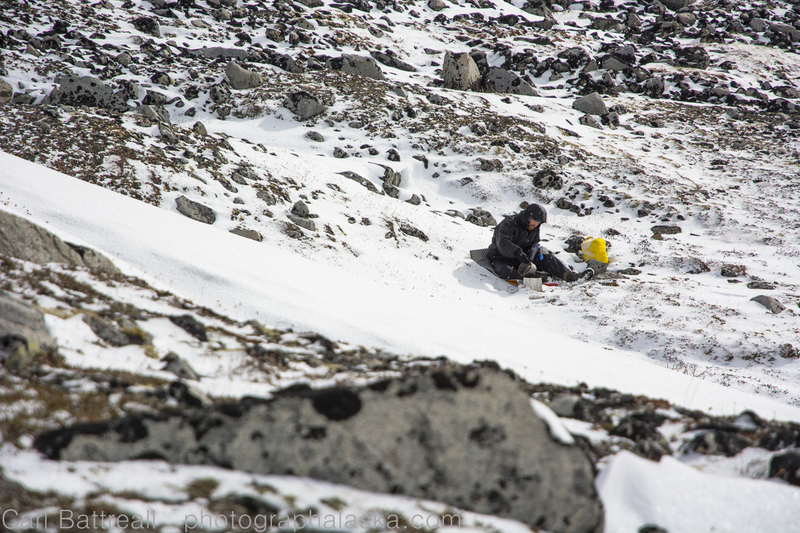 That was all that needed to be said to seal the deal; remote, no names, unclimbed. The Nutzotin Mountains are the far eastern anchor of the Alaska Range. Tucked in behind the mighty Wrangell Mountains, and lingering on the Canadian border, the Nutzotin Mountains are rarely visited by climbers, or anyone for that matter. The majority of visitors visit the historical mining town of Chisana. 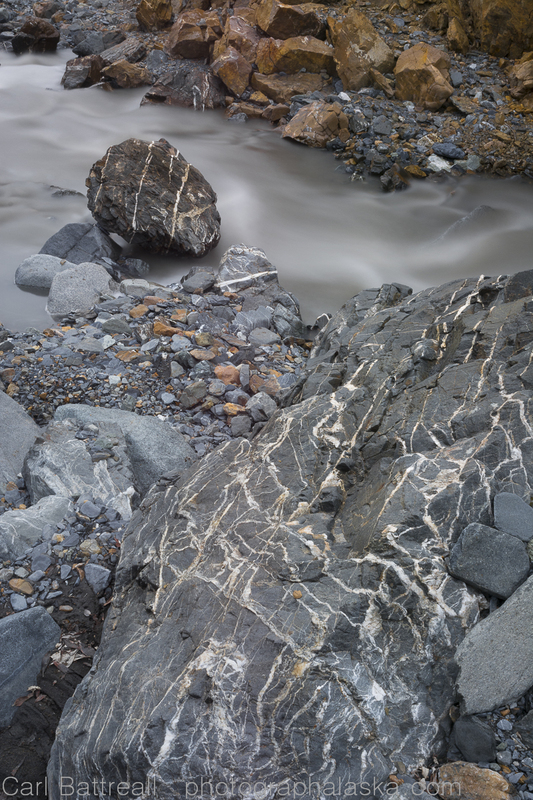 Gold was discovered there in 1913 and the rush lasted until the early 1920s. There are a few old buildings standing and about 20 hardy residents. After a seven and a half hour drive from Anchorage, we arrived in McCarthy. It was mid-May, and the town was still waking up from its winter slumber. Buildings were partially boarded up and only a handful of people mingled around, the majority at the bar. Our cell phones didn’t work so we couldn’t contact the pilot, Gary of McCarthy Air. We went to his shop and office, but it was locked up and stuffed to the ceiling with unopened boxes. We went to the bar and was quickly hustled to the side of the building by a uncharacteristically Alaskan, well groomed, young man. “Hey guys, could you hang out over here for a few minutes, we a filming a shot of the front of the building” he pleaded. When asked about “what” they were working on, we learned that McCarthy had falling victim to the new Alaskan disease, the reality show. Since October, a film crew had been filming, interviewing and generally probing the full time residents of McCarthy. 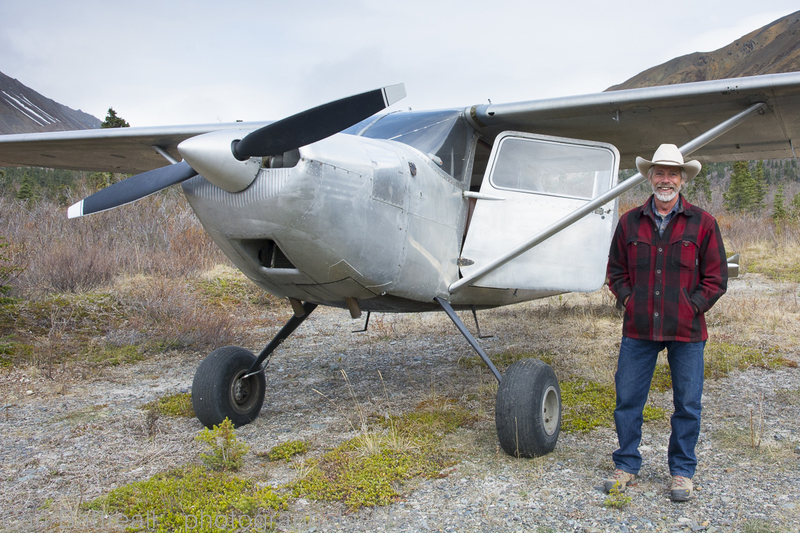 The crew bolstered with great pride about the project, but all Sy and I could think was that it was going to be another highly manipulated, over dramatized show that had a very little to do with what Alaska was really about, what it meant to go on a true Alaskan adventure, what real wilderness was. Most Alaskans have grown tired of seeing our beloved state get turned into a Hollywood fantasy. Reality shows and fictional movies, that are so absurd, so mind-blowingly stupid that the whole world thinks that Alaska is full of uncultured idiots with quick tempers and that going into the Alaskan wilderness is a sure ticket to death, a suicidal mission into such extreme wilderness that only the most macho of people would dare go. This interaction made us desperate to get out of Dodge. Ironically, only the Los Angeles film crew’s cell phones worked, so I borrowed one and gave Gary a call. He had an interview with the film crew at 2:00pm and would meet us afterwards, around 3:00pm, in front of his office. Our pilot, Gary Green of McCarthy Air. Sy and I loitered in sunshine, looking at brochures on flight seeing and glacier hiking. When Gary showed up he was flaunting a clean, red and black plaid flannel shirt and a cowboy hat. Sy wondered if it was for show or if that was how he really dressed. After some chit chat about all our shared acquaintances, he got down to business. He didn’t have a key to his own office but did have a credit card swipe for his IPhone. “How much was I going to charge you again?” he asked. “$500 a piece” I said. “Right” he replied, unaware at the killer deal he was giving us. The other pilots I called wanted $850 a piece to fly to the same spot, needless to say I was pleasantly surprised when he quoted me $500 round trip. We loaded into his tiny truck and bumped along the dusty road to the “McCarthy International Airport”. Gary filled the plane while we shuttled gear and packed the plane, loading the “sharps” : ice axes, climbing gear, poles and all other accessories in first, followed by packs. “Okay, where are we going again?” Gary asked. “Ugh…Baultoff Creek” I said with apprehension. “Yeah, right, get in.” Gary gestured and we squeezed into his tin can, a silver, polished 180. He skipped the usual flight jargon, either assuming we had spent enough time in bush planes to be unnecessary or he wasn’t quite in the tourist groove yet. Gary’s casual demeanor was both refreshing and a little disconcerting. Within seconds we were buzzing into the Wrangell Mountains. 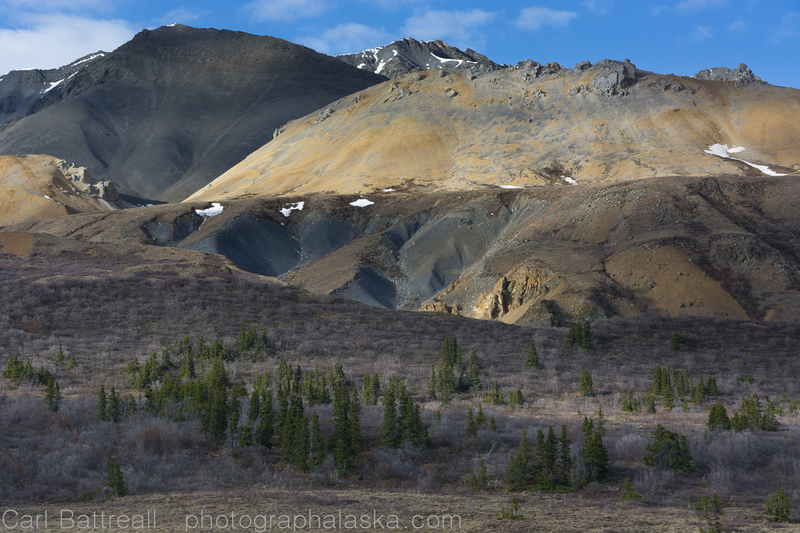 I have experienced at least fifty bush flights in the mountains of Alaska, but this was my first time through the Wrangell Mountains and I was blown away. Imagine desert and ice together. We swerved in-between huge, crumbling plateaus of red rock with glaciers dripping from their flat tops. It was a vision of the Earth’s past, when the ice of the poles pushed much closer to the equator, a few hundred million years ago. Off to the south we could see the massive white world of the Bagley Ice field and its countless ice clad summits, some of the tallest in North America. We shot out of the Wrangell’s over some rolling hills. It was a shock to go from those massive peaks to what appeared to be a flat landscape. 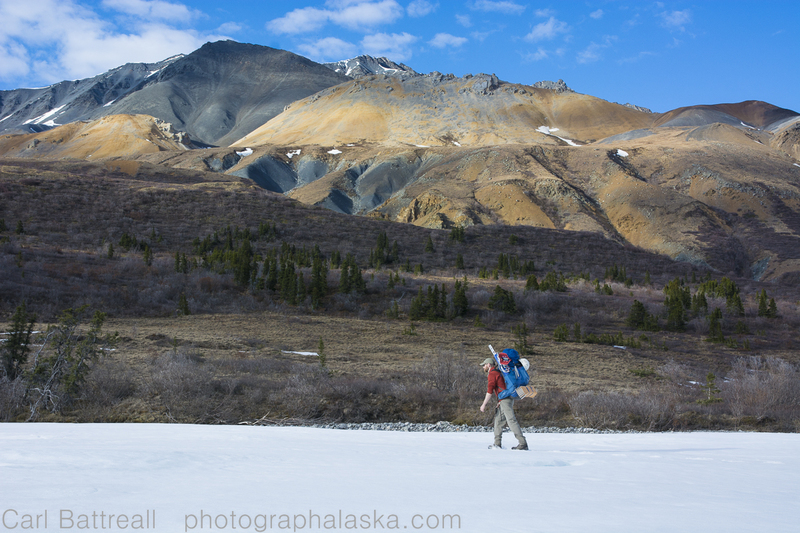 I felt like it was criminal to leave those mighty Wrangell Mountains, and for what? A small collection of insignificant humps? But the deeper we plunged into the Nutzotin Mountains, the quicker I forgot about the Wrangells and grew excited by our chosen mountains. We raced into Baultoff Creek in a rage. The plane rattled and roared. I saw the strip ahead of us and figured we would do a pass over, there was no way we were going to land at the speed we were going, I was wrong. We touched down on the over grown landing spot like a jumbo jet, skidding with flaps down. Before I could get my bearings the plane was being whipped around 180 degrees, sputtering to a stop. “ugh…Sunday Morning” I said with a concerned tone. “Right” Gary nodded with a smile. “We will be here by Saturday afternoon, so if you want to pick us up that night, you know, if the weather looks bad for Sunday, that would be fine.” Sy said. Sy had to be back to work on Monday and was a little worried by Gary’s nonchalant reply our of chosen pick up date. I had been feeling lately like my wilderness journeys had been getting watered down. The last six or seven trips I have had a SAT phone. When we first started using them they were ONLY for emergencies and at five bucks a minute, there was no way you’re were going to make late nights calls to your girlfriends. But now you can rent one for a $100 a week with twenty free minutes. They are no bigger than a large Smartphone. They had become a mandatory piece of gear. The problem was that we were using them for non emergencies, like calling family on a daily basis, getting frequent weather reports, calling the pilot early for pick-up, just because we wanted to go home. In a fit of rebellion, Sy and I decided to forgo the SAT phone. We could only rely on the pilot’s word that he would come on the date we chose. Gary raced out of the mountains as quickly as he came and a calming silence over took us. We stood motionless, enjoying the cool wind, the sound of the creek and the splendid landscape. We lumbered under our heavy packs up Baultoff Creek. 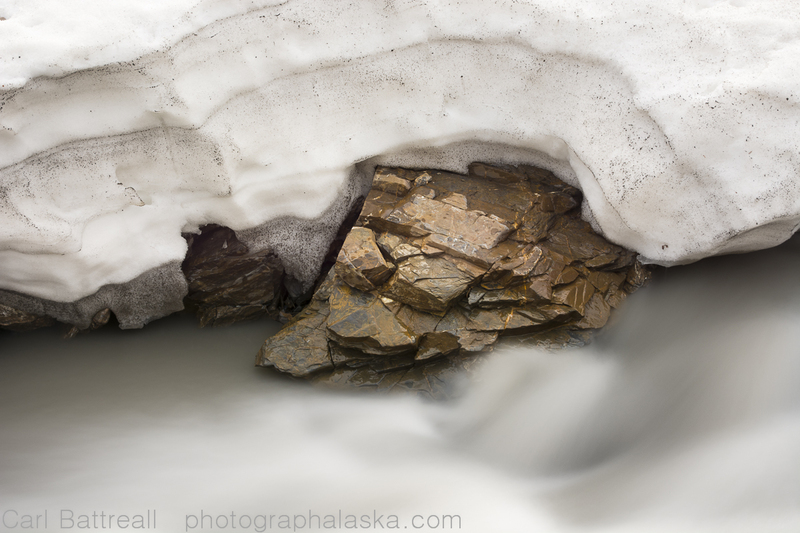 The rotten overflow ice was still solid and made for easy travel up the river bed. The same could not be said for the lingering snow, which had absolutely zero strength. One wrong step and you were up to your knees in watery slush. The patches became more frequent so we choose to climb over hills and loose rock than suffer through the foot numbing smoothie. Sy using the rotten river ice for quick travel up the creek. Another piece of technology I had come rely too heavily on was Google Earth. 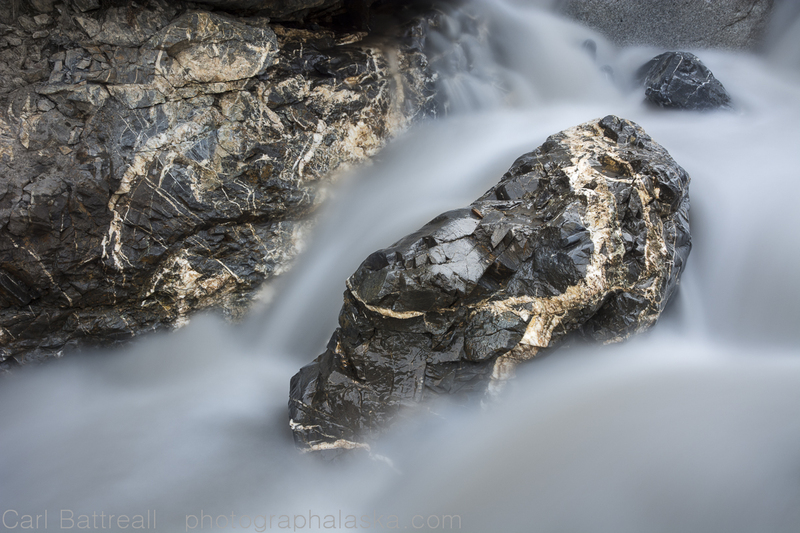 I have come to rely on its high-resolution images to choose photography locations and routes through remote wilderness. 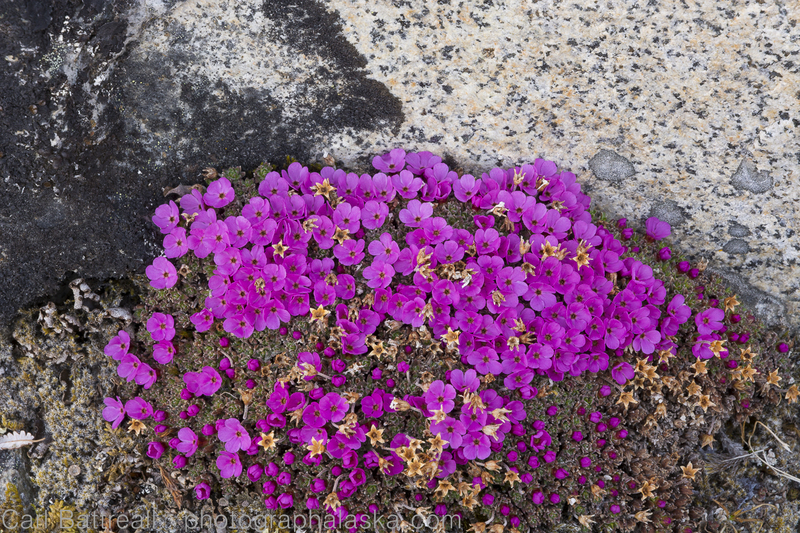 However, much of Alaska has poor image quality and the Nutzotin were one of those areas. This meant we had to rely on our 60-year-old topo maps and our years of back-country experience. This just added to the value of our journey and simply made every decision more rewarding. Tired and hungry we made camp around 10pm. We watched pink light dance on the rounded peaks as we relaxed on the tundra. 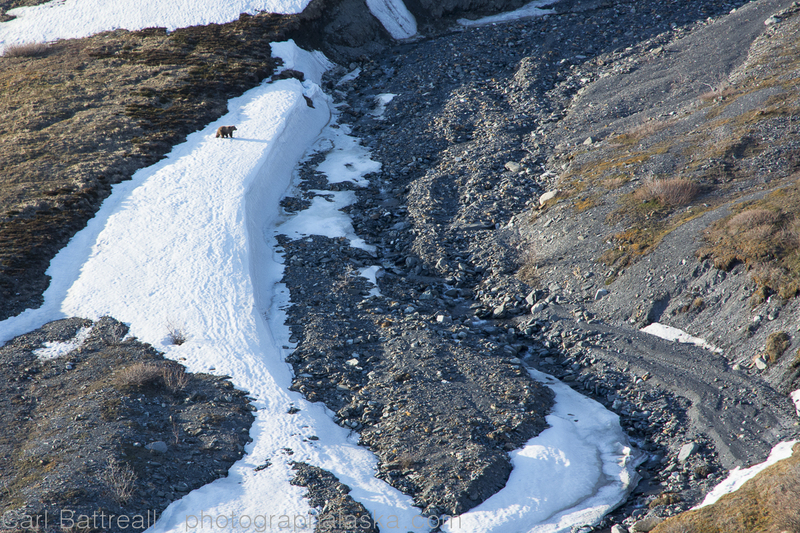 We were entertained by the cliff-side antics of Dall Sheep. 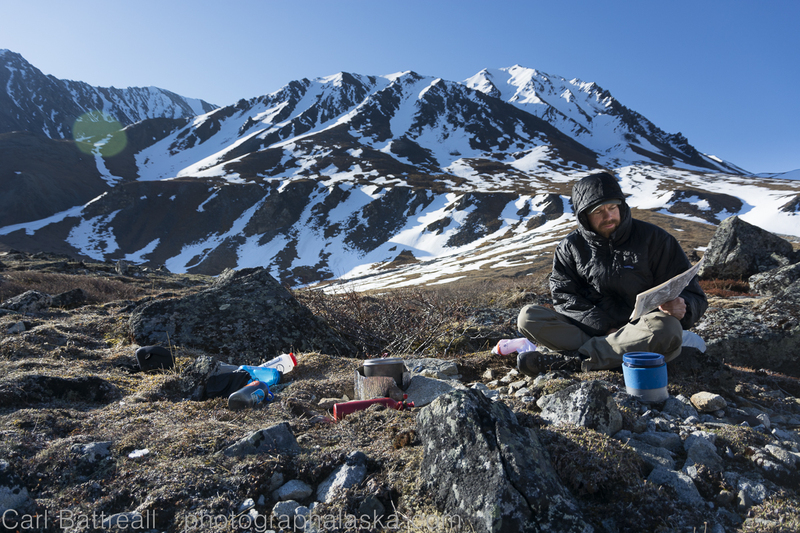 With warm food in our bellies, we came to the conclusion that few things are better than a spring evening in the Alaskan wilderness. Post dinner map reading and sheep watching. 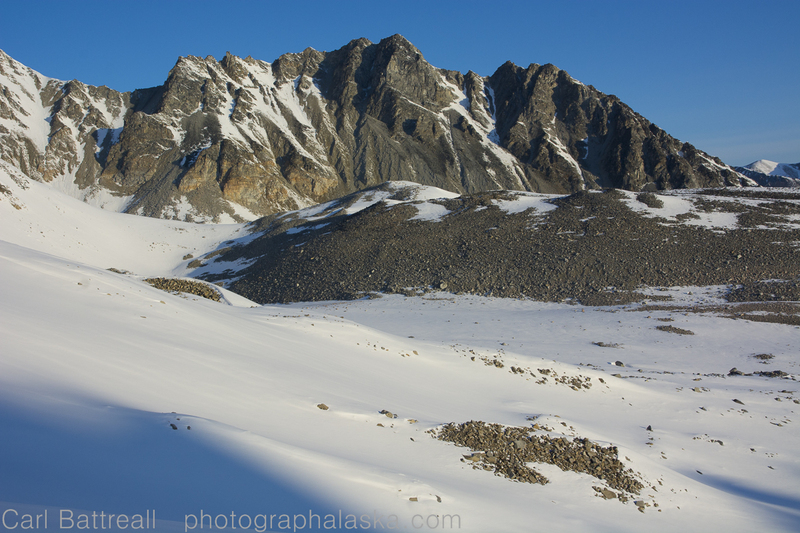 The next morning we slogged up to our chosen base camp, at the base of the massive terminal moraine of the Baultoff Glacier. 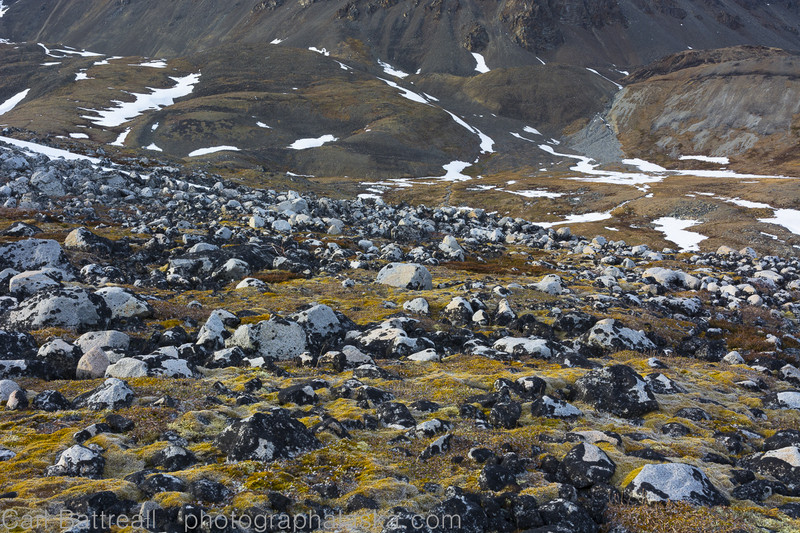 It was getting harder and harder to avoid the patches of soft snow, so we took are chances on the unstable, lichen spotted boulders of the moraine. We were often seduced by the smooth ease of the snow, quickly cursing our poor decision as we struggled to extract ourselves from the frozen mush. Beautiful lake in the middle of the moraine. After we established camp, we went bounding across the moraine, free of our heavy burdens. We hunted for views of the surrounding peaks. I had picked a handful of peaks that, from looking at the map, could have potential for fun climbing. None of them had names nor any recorded ascents. The fact that we had to make our own route decisions, no guidebooks to refer too, no beta from others, was so liberating, so exciting that our stomachs ached with anticipation and anxiety. High up on the moraine a large peak came into full view and instantly we knew that we would try to climb it. Were shared the area with a wiry red fox. I realized that I hadn’t heard a plane or seen a jet since we were dropped off (and we wouldn’t our entire trip), a rarity in Alaska, or anywhere in the world for that matter. We watched a skinny, calico fox hunt ground squirrels as we told stories and shared our growing fondness for the Nutzotin Mountains. Spring was trying hard to arrive. As the evening approached, the wind began to pick-up. Low clouds stretched over the summits, a sign of approaching weather. A few hours later and we were in a full on storm. We dove into the tent and watched it bend with each punishing gust, which easily reached 45 miles an hour. Snow came whirling down from above and worked its way into every weak spot. The heavy snow began to build up under the tent’s fly, coating it’s mesh body. After a restless night we woke to partial clearing. With hazy minds, we dragged ourselves out into a new scene, winter. Luckily, by mid day the sun was blazing again and the new snow melted quickly. During the storm, I had gotten up in the middle of the night to take a leak and walked out onto the old snow, it was firm and held my weight. That confirmed what I had suspected, the only chance we had on climbing any mountain was to leave at 3:00am and try to get back down before the snow got too soft, which was around 8:00am. After a day of lounging and exploring, Sy went to bed early. I wanted to crawl into my bag too, but I am photographer, driven by a subconscious force, an uncontrollable need to follow the light until it has faded into darkness. I stumbled into the tent around midnight. It’s always hard to sleep before an alpine start, I was anxious about what we would discover higher up. We couldn’t see the mountain, it was hidden from our camp, nor could we see the summit from our mountain view spot, we had no idea what to expect. Under a bright, glowing night sky we walked up the old river ice towards the toe of the glacier. 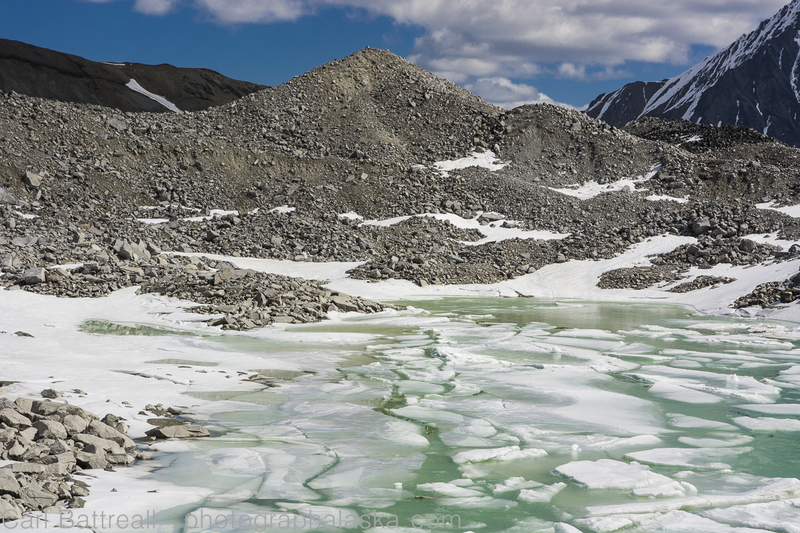 It’s crusty surface made for easy travel through the jumbled moraine. With hesitation we crossed large swatches of snow and were pleasantly surprised by their firmness, we knew that once we got out of the moraine, it was all snow. We had brought snow shoes, a last-minute decision that we were happy we made. We decided not to wear them until it was totally necessary, knowing how much more slowly we would travel once they were on. We needed to move as quick as possible in order to summit and get down before the snow softened up and would no longer support us. About an hour up I decided to take a photograph of Sy coming up through the moraine and then realized I had left my camera at the tent. 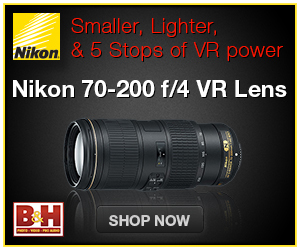 Over twenty years as a working professional photographer and I had forgotten my camera! If I went down to get the camera we would lose valuable time, possibly killing our summit attempt. But Sy and I knew I had to go back. We decided he would keep going up the glacier and I would try to catch up. I dropped my pack and sprinted down the river, happy that it was still frozen enough to support myself running in boots. I reached the tent and bolted back. I did the round trip in 45 minutes. The spot where I realized I had forgotten my camera. By the time I returned, the sun was coming up. I reached my pack and scanned the mountain looking for Sy and was surprised to see him so low on the mountain. 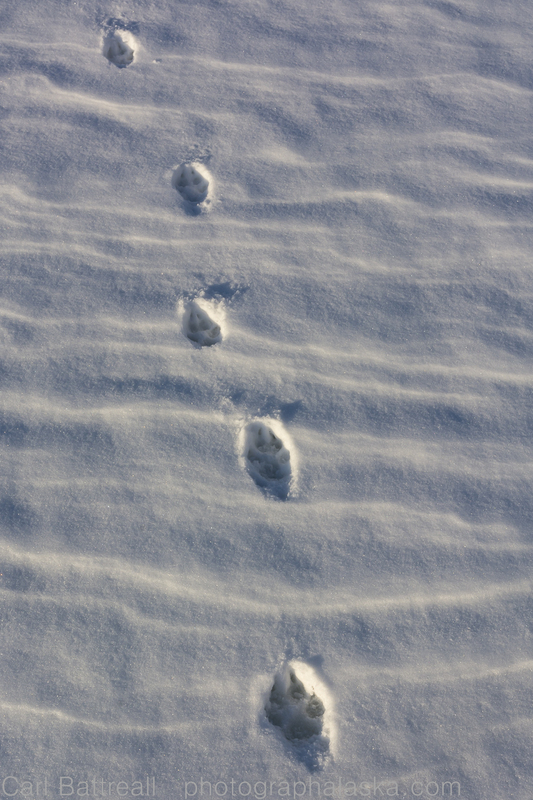 I followed his tracks as they grew deeper into the snow. One inch, two inches…at about five inches, he switched to snowshoes, so I did the same. I caught up to him as he lounged in the snow, eating a snack. The sun began to crest the distant mountains and he was enjoying its warmth. The sunlight on the snow would hasten the snow softening process, our time was running out, it was time to push ourselves. I took over the burden of leading through the soft snow. The stellar views were becoming a distraction, a sea of endless peaks. We reached the large plateau below the main summit pinnacle, quicker than we expected. We had two ascent options. One was a huge 40 degree face, about 800 feet high. There was some obvious slide activity on the face and after the all the new snow and wind, we decided it was too sketchy. Our other option was the south ridge. 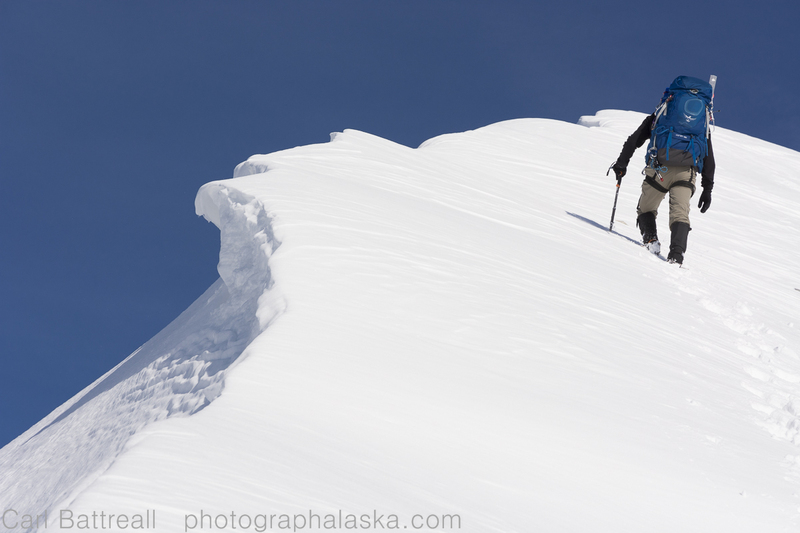 It was a very aesthetic, narrow ridge with delicate cornices and a few steep bugles. It look great. We decided to stay unroped and switched to crampons. I let Sy have the honor of leading the way up the beautiful precipice. 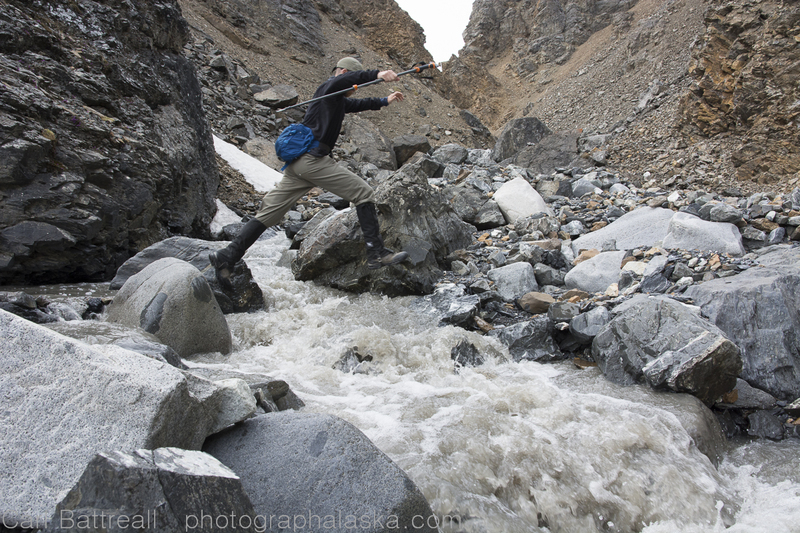 We shuffled around a few rocky sections, crampons desperately gripping the loose rock. The views just kept getting more and more outstanding. Our excitement grew as the ridge became less steep and the sky above grew larger and larger with each step. 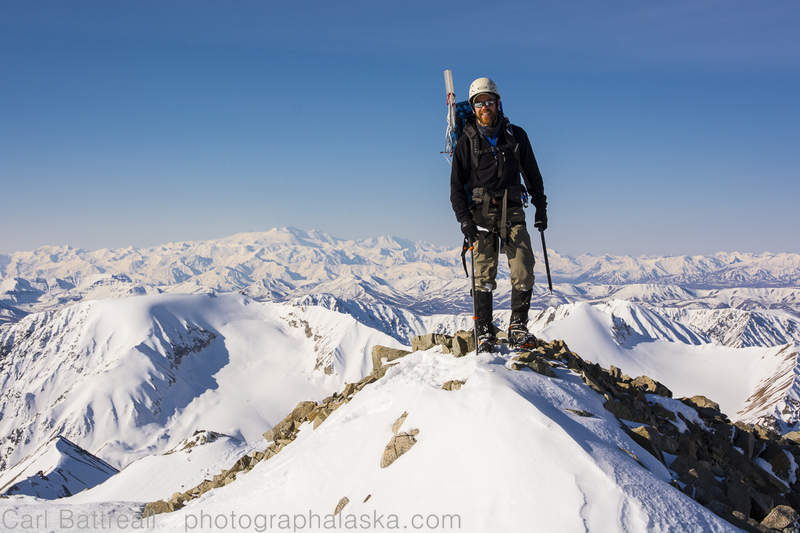 I felt like surging to the top, adrenaline at its maximum, but we both knew we needed to be wary of the Alaska Range’s infamous, hidden summit crevasses. Sy reaching the top on the south ridge. Without incident we arrived on the skinny summit. We both smiled, it was a 360 degree view, clear as could be. The mighty Wrangell Mountains demanded our attention, rising up like frozen sentinels, guarding the sea. It was flawless, a perfect summit. Everything went as planned. It was pure bliss and yet, I wasn’t completely at peace. I couldn’t help thinking that it was all too easy. Was this really an adventure? What would others think? Dull and boring I figured. No speed records or extreme routes accomplished, no epics, no fighting, no animals out to eat us, there was no drama, no story for Hollywood. I realized that no matter how much I had tried to avoid all the crap about Alaska and modern “adventure”, it still had sunk into my own subconscious. 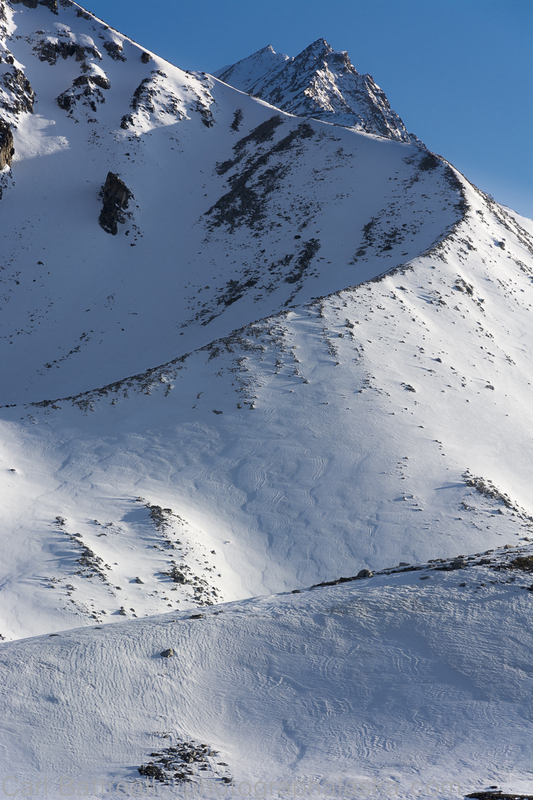 I sat down and took a deep breath and looked at Sy, who was enjoying the moment, feet dangling off the steep north face. Sy on the summit of Hidden Peak, peak 8514, Nutzotin Mountains. I came to the conclusion that I didn’t want or need any of the drama our society told me was required for a modern adventure. For Sy and I, this journey was everything we needed from the mountains. 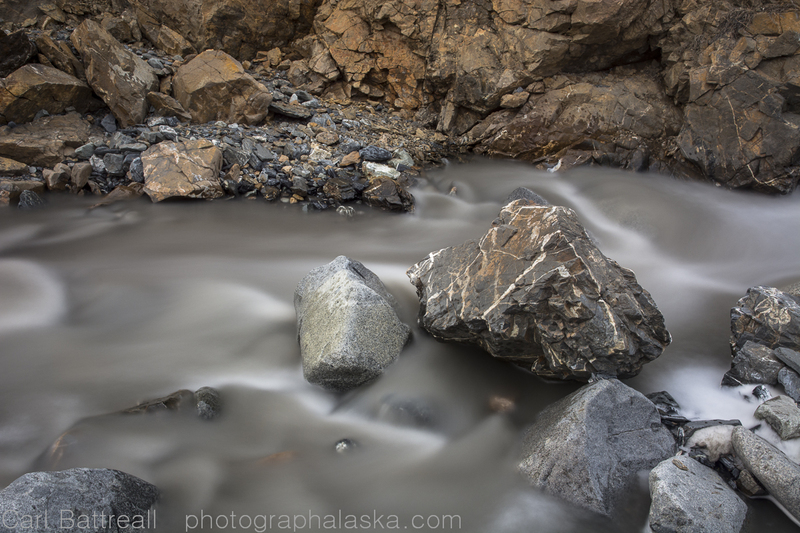 Alaska had given us the gift of true wilderness. We felt isolated and remote, but not alone. It was a classic good time, with a good friend, in a truly wild place, it was the reality of real Alaskans. If you want to know what happen during the rest of our journey read this post Grizzly Gorge.